Fortunately, reliable lightning protection of buildings and structures is available. Data on the cost of installing lightning protection, however, has not been readily available. The purposes of this study, therefore, are 1) to understand the cost of installing lightning protection, and 2) to provide building owners and their architects, engineers, and risk management consultants with cost estimating guidelines for use during the planning and design phases of construction projects. To prepare this study, East Coast Lightning Equipment, Inc. collected construction cost data from lightning protection installers throughout the US. 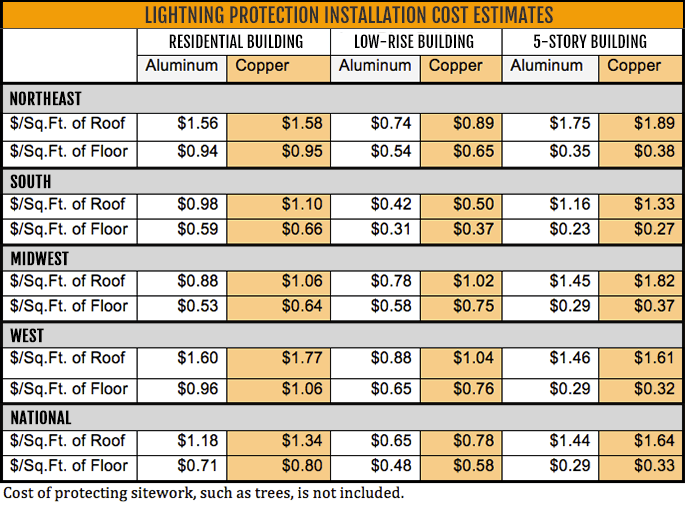 The cost data, summarized below, confirm that lightning protection is economical and can be justified on a cost-to-benefit basis in at-risk buildings. installation of lightning protection on three hypothetical projects. Prices were to include installer’s overhead and profit but not a general contractor’s markup. The projects include a single-family residence, a low-rise building typical of educational, commercial, and industrial occupancies, and a five-story building typical of many office buildings, healthcare, and similar occupancies. See Appendix for survey instrument. 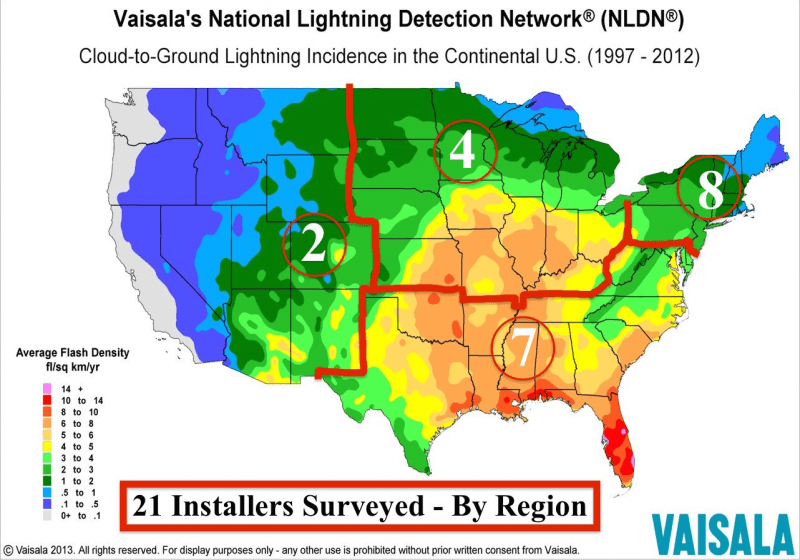 Responses were received from 21 installers that are certified for lightning protection work by the Lightning Protection Institute. The distribution of respondent trade territories is shown on a map according to US Census Regions. The distribution of respondents is similar to the frequency of lightning strikes; higher in Eastern and Southern states, least in the West. The results were tabulated by Michael Chusid, RA, FCSI, an independent construction consultant, www.chusid.com, and are summarized below. Cost of protecting sitework, such as trees, is not included. General: Variations between regions are due to regional trade practices, wages and benefits, soil conditions governing the type of ground terminals used, and other factors. Variations within regions can also be significant, especially between urban and rural locations. 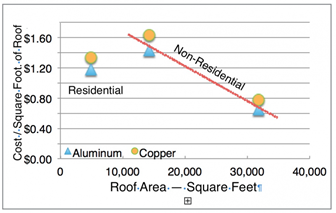 Copper lightning protection equipment is generally more expensive than aluminum due to commodity prices. There are also regional biases that favor one material over the other. 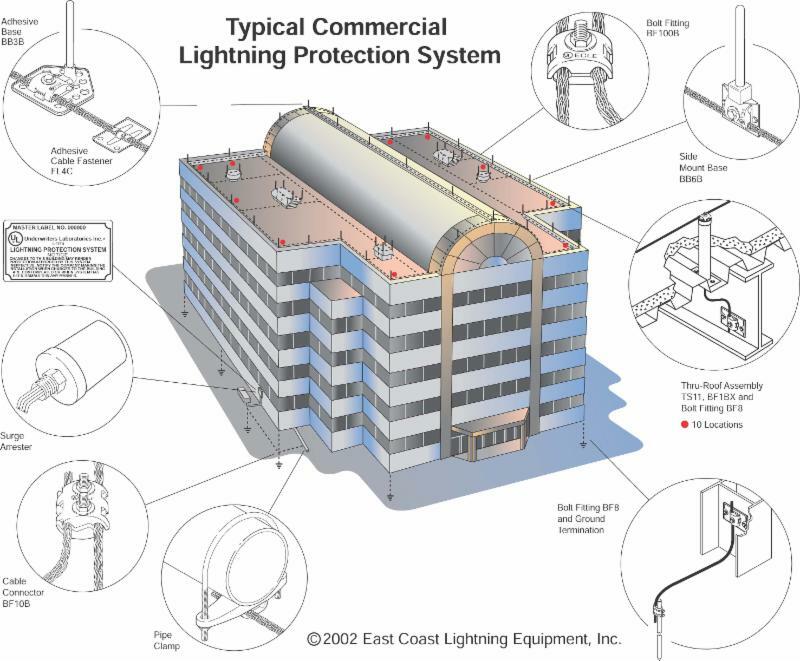 Nonresidential Buildings: In nonresidential buildings, roof area is the most significant factor in determining the work required to install lightning protection. Hence, multistory buildings will generally cost less per square foot of interior floor area. Costs will generally be more in buildings with extensive rooftop equipment and demanding architectural considerations; less in building with a modicum of rooftop equipment and a simple configuration. Buildings over 75 feet in height (Class II) will incur additional expenses. These estimates do not apply to buildings that house explosives and other special occupancies. Residential Buildings: In most homes with pitched roofs, air terminals need only be installed at the roof ridge, not the perimeter of the roof. 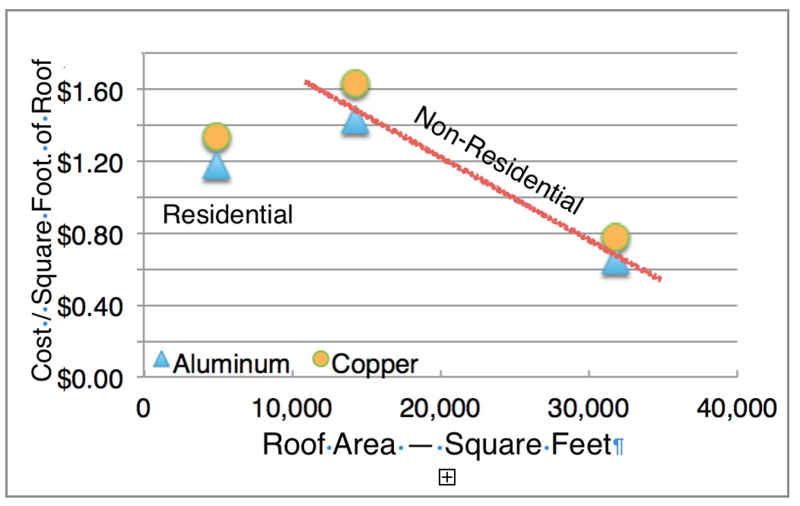 This explains why lightning protection costs for the home in our study is below the trend line shown for non-residential construction. Note, however, features such as dormers, chimneys, balconies, skylights, rooftop equipment, and large flat areas can add to the cost. These cost estimates can be used in the early stages of planning or designing a project. 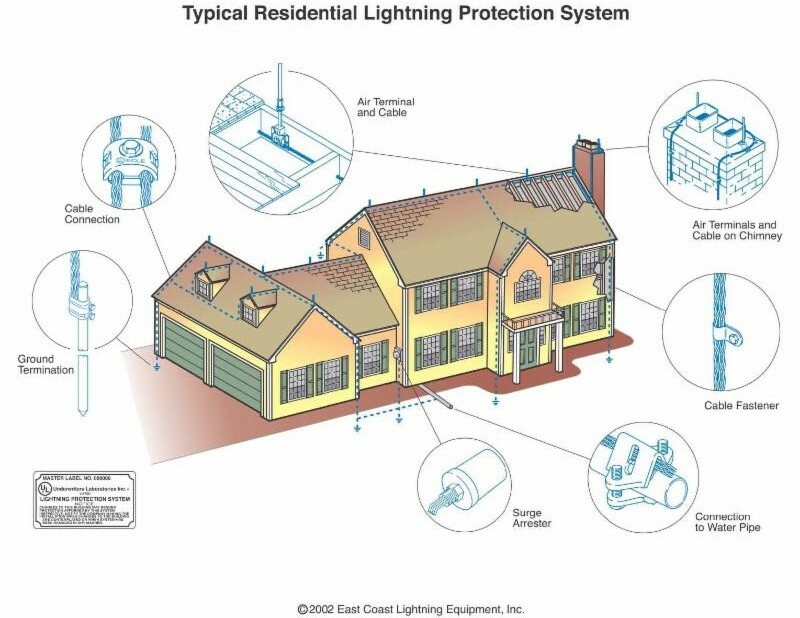 Once the overall configuration of a building is determined, consultation with a qualified lightning protection designer or installer will yield a more accurate estimate and identify ways to improve protection while reducing costs. These cost estimates are subject to change with time and can be adjusted using the Engineering News Record Construction Cost Indexes or other databases of historical construction costs. 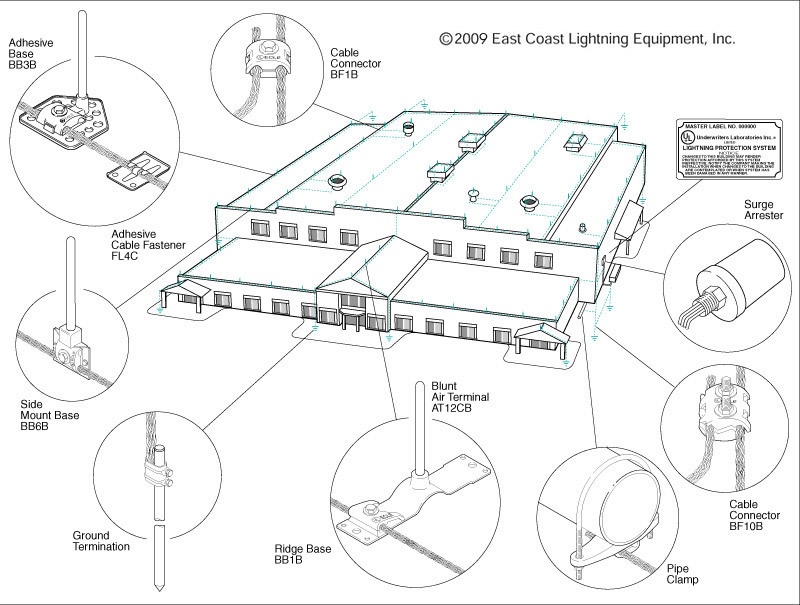 Lightning protection costs are also subject to fluctuations in raw material costs. The following survey instrument was sent via e-mail to qualified lightning protection professionals. ECLE requests your assistance in creating cost estimating guidelines that can be used by architects and engineers. Many designers ask us about the cost of installing lightning protection so they can include lightning protection in their project estimates. Your information will help them make better cost-to-benefit calculations that will, we believe, make it more likely for them to specify lightning protection. Please take a few minutes to look at the three buildings below then send us your price estimate to perform each of the installations. Your data will be confidential. Michael Chusid, RA FCSI, a construction industry consultant, will compile regional and national averages and use the information to write articles for leading construction industry publications. We will send you a copy of his report as our thank you.